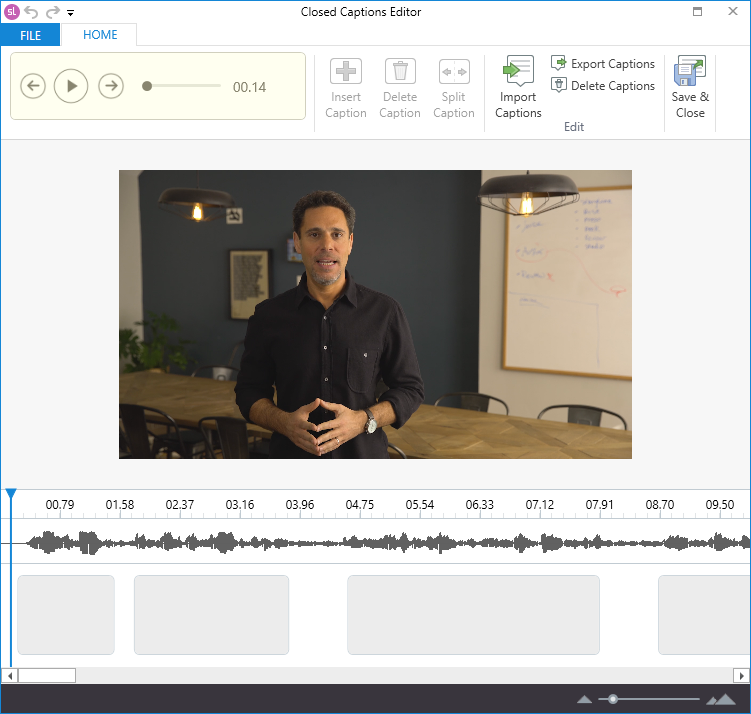 Create and edit closed captions right in Storyline 360 with the built-in editor. Fine-tune imported captions or quickly add new ones with the help of caption placeholders that are already synced with your audio and video content. Here’s how. Select a video or audio track in your course, go to the Options tab on the Storyline ribbon, then click either Add Captions or Edit Captions. The button will change depending on whether your media clip already has captions. If you’re working with an interactive marker, right-click the marker, select Accessibility from the context menu, then click either Add Captions or Edit Captions in the window that appears. 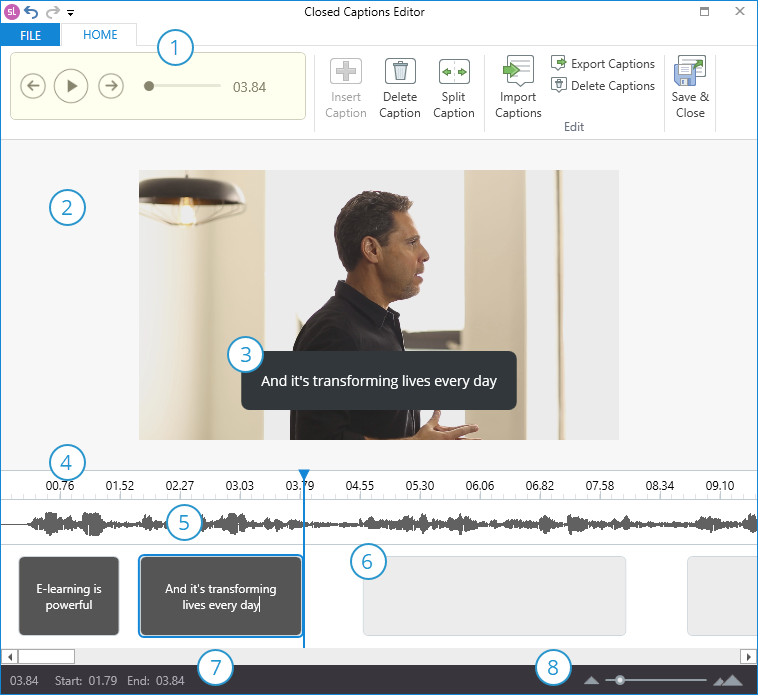 If your media clip doesn’t already have captions, the closed captions editor will automatically analyze the audio track to detect units of speech and add caption placeholders to the timeline that are synchronized with your content. All you need to do is type your captions in the placeholders. Brilliant! Background music can interfere with the auto-generated caption placeholders, so you might need to tweak the timing of captions, add more caption placeholders, or split captions into smaller chunks. Explore this image of the closed captions editor and the numbered list below it for an overview of the interface. See the sections that follow for details on each feature. When you’re working with a video, it'll display on the video stage. When you’re working with an audio clip, the video stage disappears and the audio waveform fills the editor. As you type captions into the placeholders at the bottom of the editor, they’ll display on the video stage or audio waveform so you can see how they’ll look in your published output. The timeline shows the duration of your media, and the blue playhead travels along the timeline as you preview your video and audio content. The audio waveform is a visual representation of the audio track in your media. If there’s no video component for your media, the audio waveform will expand to fill the stage. Caption placeholders are where you type and format text. You can also adjust the timing and duration of caption placeholders. If your media clip doesn’t already have captions, the closed captions editor will automatically analyze the audio track to detect units of speech and add caption placeholders to the timeline that are synchronized with your content. All you need to do is type your captions in the placeholders. Caption placeholders have four states, so you know what to expect when creating and editing captions. See the next section to learn about caption states. The status bar shows you the current position of the playhead on the timeline, the start time of the selected caption placeholder, and the end time of the selected caption placeholder. Use the zoom slider in the lower right corner to zoom the timeline, audio waveform, and caption placeholders in and out when you need to make precise edits or get a big-picture overview. Caption placeholders have four states as described in this table. The closed captions editor may behave differently, depending on the current state of a caption. See the following sections for details. For example, if no captions are in edit mode when you preview, playback will continue to the end of the timeline unless you pause it. However, if a caption is in edit mode when you preview, playback will stop at the end of the caption placeholder. And if you resume playback while the caption is still in edit mode, it'll start from the beginning of the current caption placeholder and stop again at the end. This helps you create captions one at a time, letting you hear a clip as many times as you need while typing. To preview the entire video or audio track, move the playhead to the beginning of the timeline—before the first caption placeholder—then click the Play button on the ribbon or press Enter on your keyboard. Drag the seekbar on the ribbon or the playhead on the timeline to scrub back and forth through the video or audio track. To preview just one caption, click inside the placeholder so it’s in edit mode. Playback will start as soon as you click inside it and stop when it reaches the end of the caption. To pause the preview, click the Pause button on the ribbon or press Enter. Press the Tab key on your keyboard to jump to the beginning of the next caption, and press Shift+Tab to jump to the beginning of the previous caption. Or, click the left and right arrows on the ribbon to move back and forth between captions. If no captions are in edit mode when you navigate between them, the playhead will simply move to the previous or next caption, but the media won’t start playing until you tell it to. If a caption placeholder is in edit mode when you jump to another caption, the new caption placeholder will also switch to edit mode so you can immediately start typing. Tip: By using the Tab key to move through caption placeholders in edit mode and pressing Enter to play/pause media, you never have to take your hands off the keyboard while typing captions, speeding up your workflow. To add or edit caption text, simply click inside a caption placeholder and begin typing. You can also paste text from external sources, such as text files or Word documents. When you click inside a caption placeholder, it switches to edit mode and your media automatically begins playing. If you need to pause it, just press Enter. To resume playback, press Enter again. If you need to add a line break to a caption, press Shift+Enter. When you open the closed captions editor, the playhead will be positioned at the beginning of the first caption placeholder, and it'll be in edit mode. Press Enter to start playing your video or audio track, then begin typing text for the first caption based on what you hear. Playback will stop at the end of the placeholder so you have time to finish typing the caption. If you need to hear it again, just press Enter and it'll start over from the beginning of the placeholder. You can also use Enter to pause playback. Press Tab to move to the next caption placeholder. It'll switch to edit mode, and your media will being playing. Simply type what you hear. Repeat step 2 to add captions, one placeholder at a time, until you reach the end of the timeline. You can change the font and font size for closed captions in the player properties for your course. Click here for details. Lucy: And it’s transforming lives every day. If you import a caption file that has voice tags, the tags will be converted to the speakers’ names followed by colons, as shown above. Work faster in the closed captions editor with these keyboard shortcuts. If the playhead is at the beginning or end of a caption placeholder and the placeholder is in a selected state, the left arrow key moves the placeholder .25 seconds to the left on the timeline (or less than that if it bumps up against the previous caption placeholder). Otherwise, the left arrow key moves only the playhead .25 seconds to the left on the timeline. If the playhead is at the beginning or end of a caption placeholder and the placeholder is in a selected state, the right arrow key moves the placeholder .25 seconds to the right on the timeline (or less than that if it bumps up against the next caption placeholder). Otherwise, the right arrow key moves only the playhead .25 seconds to the left on the timeline. If the playhead is at the beginning or end of a caption placeholder and the placeholder is in a selected state, this shortcut moves the placeholder .5 seconds to the left on the timeline (or less than that if it bumps up against the previous caption placeholder). Otherwise, this shortcut moves only the playhead .5 seconds to the left on the timeline. If the playhead is at the beginning or end of a caption placeholder and the placeholder is in a selected state, this shortcut moves the placeholder .5 seconds to the right on the timeline (or less than that if it bumps up against the next caption placeholder). Otherwise, this shortcut moves only the playhead .5 seconds to the right on the timeline. When a caption placeholder is selected, shorten its duration by .25 seconds. When a caption placeholder is selected, lengthen its duration by .25 seconds (or less than that if it bumps up against the next caption placeholder). When a caption placeholder is selected, shorten its duration by .5 seconds. When a caption placeholder is selected, lengthen its duration by .5 seconds (or less than that if it bumps up against the next caption placeholder). This shortcut moves the playhead to the beginning of the current caption placeholder or the end of the previous placeholder, whichever is closest. This shortcut doesn’t work when a caption placeholder is in edit mode. This shortcut moves the playhead to the end of the current caption placeholder or the beginning of the next placeholder, whichever is closest. To adjust the timing of a caption, simply drag the placeholder left or right along the timeline. To change the duration of a caption, drag either end of the placeholder along the timeline to shorten or lengthen it. You can also use several arrow keyboard shortcuts in the table above to tweak the timing and duration of caption placeholders. Although the closed captions editor does its best to create caption placeholders for you that are already synced with your content, there may be times when you need to manually add a caption placeholder to the timeline. Click any space on the timeline that isn’t already occupied by a caption placeholder. The blue playhead will move to that position on the timeline. Then click Insert Caption on the ribbon. New captions are four seconds long by default—unless there isn’t enough space to fit a four-second placeholder, in which case it'll fill the available space. You need at least half a second of empty space on the timeline to insert a new caption placeholder. If there isn’t enough space, the Insert Caption button will be grayed out. Select the caption placeholder and press Delete on your keyboard. Select the placeholder and click Delete Caption on the ribbon. Right-click the placeholder and choose Delete from the context menu. To delete all captions at once, click Delete Captions on the ribbon, then click Yes on the confirmation message. You can split a caption into two placeholders when you need more control over timing and duration. Just select the placeholder and click Split Caption on the ribbon. Or, right-click the placeholder and choose Split Caption from the context menu. The original placeholder will split evenly in half. And if it has text, the text will split where the cursor is located—everything before the cursor will move to the first placeholder; everything after the cursor will move to the second placeholder. Exception: If the playhead is at the beginning of the caption and the placeholder is in a blue selected state, all the text will move to the first placeholder after being split. If you already have captions typed in a document, you can import them via the closed captions editor. Note that this replaces all the existing captions for your video or audio track. Click Import Captions on the ribbon. Click Yes when asked to confirm that you want to replace the existing captions. Browse to the SRT, SBV, SUB, or VTT file you want to import and click Open. You can also import caption files without opening the closed captions editor. See this user guide for details. Export closed captions when you need to use them in another project, edit them with a different app, or save a backup copy. Click Export Captions on the ribbon, choose a location where you want to save the caption file, then click Save. When you export captions from the closed captions editor, it generates a VTT file. If the closed captions editor is open, click Export Captions on the ribbon and save the file to your computer. You can also export captions without opening the closed captions editor. Just select the video or audio track, go to the Options tab on the Storyline ribbon, and click Export. Open the captions file in a text editor or a translation program, replace the captions with translated text, and save the file with your changes. In Storyline, select the video or audio track again, go to the Options tab on the ribbon, and click Import to bring the translated captions back into your course. Closed captions aren’t included when you export text strings from your course for translation. To save your changes, click Save & Close on the ribbon. To discard your changes, click the X in the upper right corner or go to the File tab on the ribbon and click Exit. The closed captioning button on the course player is enabled by default, but you can disable it if you plan to build your own custom controls. Click here for details. If the closed captioning button is enabled on your course player (see above), learners can toggle captions on and off whenever they want. However, you can also control captions via triggers. Click here for details.